Emphasize the earthy beauty of natural stone by taking advantage of our top picks for slate backsplash tile. From the smooth honed surface stone to the textured 3D look of natural cut stone, slate backsplash tile ideas will bring your kitchen to life. We know that this trendy material can be found all over the world, but what about its origins? Slate is a metamorphic rock, and it’s composed mostly of minerals, it has great durability and appearance, making it ideal for indoor and outdoor spaces. The slate can be used in a variety of places such as a backsplash, roofs, interior flooring, exterior paving, and other decorative elements. Flexible and good looking, it is a unique characteristic slate material in terms of qualities. The extraction of Slate happens in different places as Spain, Brazil, China, and Australia, where they are mostly used in roofs and for flooring. The slate was formed in low heat and pressure, and some fossils can be found in this material. Interesting, right? Incredible material with incredible origins. Bringing a nature looking ambient, the slate tile colors are determined by the amount and the type of iron and organic materials that are present in the rock. The shades can vary between grey tones, green ones, red, black and more earthy colors like beige, brown & rusty brown. One advantage of having a Slate backsplash TILE on your space it’s the looks. Every sheet of mosaic comes different from one another, for that reason you don’t have to worry about having your beautiful design in someone else’s space. Every slate backsplash is unique! Bringing nature to your space never looked so great, am I right? RISING SLATE TILE BACKSPLASH TREDS? Once upon a time the backsplashes were only used for wall protection in the kitchen area (protect from water/stains/ grease to affect the walls), up until today, this remains its main function, but since a few years now the use of the backsplash has been more than only functional, serving also as decorative element for spaces due to its coloration and style. It has been inserted in kitchens all over the world, and every day more, new trends around this beautiful element have been presented to new buyers everywhere. Going to a store to make your purchase must be a difficult task due to all new materials and trends on the market, but guess what? If you are looking for a material that never gets old, and after all these years is still a best seller when talking about backsplashes, the slate backsplash is the trend you are looking for. The variety of colors is immense, and it will be an easy task to match pretty much any kitchen style that you are looking to create. Some materials create a great contrast with other elements for your space, while others are a bit subtler but still, a great style can be created! The grouted can also be matched since you can choose the color you want to combine with your choice of tiles. It really doesn’t matter what type of kitchen you are planning on remodeling, you will find a slate backsplash tile that matches your ambient, resulting in different kinds of feelings thanks to its flexibility to contrast with other elements in the space. You will find in this article the best ideas and points to consider before choosing this amazing material for your ambient. Let’s do it? WHY SHOULD I CHOOSE A SLATE BACKSPLASH? You might ask, between all the variety of products in the market, why the slate backsplash tile? The material can be matched with different kitchen styles, and it’s being natural offers you a unique look!. Timeless design never gets old. It has a variety of patterns, so you’ll never get bored! It is fire resistant! Considering that you are in a kitchen space, slate stone will not effect from heat, this is something to consider. Are those qualities enough for you? Because there is more! Every sheet of slate backsplash tile mosaic comes different from one another, for that reason you don’t have to worry about having your beautiful design in someone else’s space. WHAT TYPE, COLOR AND PATTERN COUNTERTOP SHOULD I CHOOSE FOR SLATE BACKSPLASH? Of course, great interiors are made of single elements, and to combine the countertop with the slate backsplash tile most people use one of the most beautiful materials for kitchens, with great appearance and resistance: granite. The combinations of colors and styles that can be created are infinite! All of them bringing class and comfort. Ready to make yours? Granite is durable, heat resistant, a very hard material, not easy to scratch, and if well taken care of, it won’t absorb any liquids, which is important since we are using it near a cooktop! 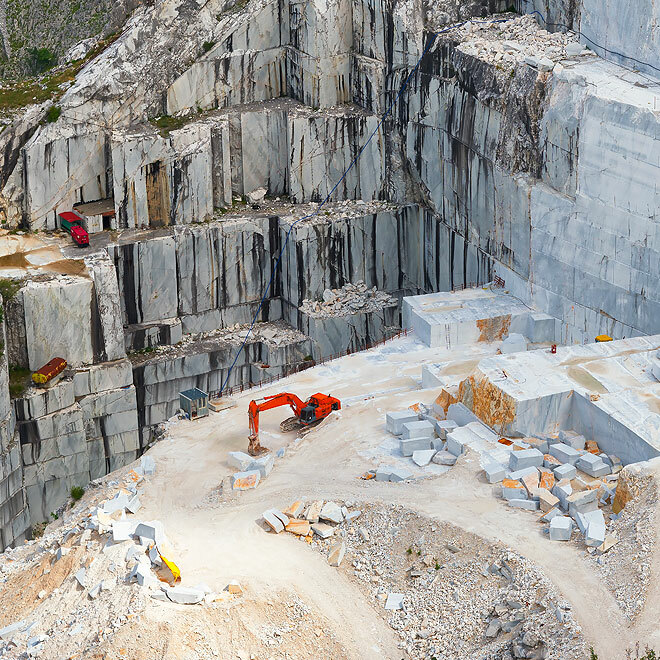 The combination of minerals in the granite stone creates the variety of colors, for example, if the stone has a lot of quartz you will obtain a whiter coloration, but if the stone has a considerable amount of Potassium Feldspar, you will get a pink/salmon color. Interesting, huh? If you have located at D.C metro area and would like to go with granite countertop visit top rated SKY Marble for free design consultation and stone selection. You can get very creative with combinations; a white granite countertop can match beautifully with a dark gray slate subway backsplash! Another great choice in material for countertops is quartz countertops such as Cambria, Silestone, Corian, Caesarstone, and Q Quartz. Quartz countertops come from Natural quartz, which is one of the hardest minerals on Earth and a small quantity of glass or metallic flecks are added so a variety can be created. The material is non-porous, which means bacteria can’t grow on it and it is resistant to stains. The material doesn’t need to be sealed. Another important thing to think about before buying is: which pattern are you looking for? Which coloration? What is the atmosphere you want to create in your space? A lot of important choices! What I can guarantee is that you will achieve a WOW factor when everything will be done! Down below a few options that will blow your mind! This material gives your space a more rustic look if you are looking for a warm, and cozy ambient this tile will do wonders for your kitchen. This tile comes in a different color such as brown, rusty brown and gray, so you can complement your kitchen beautifully. Every sheet has unique colors, it comes with large and small iridescent color coated burgundy color glass inserts. The iridescent coatings give the glass tiles a different color look that can change depending on the light source and the angle you are looking from. Modernity is the word when talking about the dark gray slate backsplash. This beautiful material can be easily matched with a flat front white cabinetry and granite counter top! If you think the slate backsplash will match with your space don’t hesitate to look at it, and maybe even order a sample! Great looking, beautiful coloration and uncommon style. Is this what you are looking for? If so, this dark gray tile is the solution. You can match it with white cabinetry and granite countertop. The Subway tile is a long-lasting classic, you can use in a variety of spaces, it has been used in different patterns, especially vertically to create the impression of height. This style that came back as a trend has been used in a variety of colors! Great option for backsplashes and wall applications. This tile brings a rustic feeling to your space. It can be used indoor and outdoor due to its low water absorption and great resistance. This design will look great in mounting houses and houses with a country style! There is no denying how natural this backsplash is, am I right? Are you a big fan of the antique and decadent look? Well, you can’t go wrong with this subway tile. It contains a quartzite slate stone base and has a very shiny effect!! You will get out of your comfort zone and create a spectacular environment. This is the first thing to do. Backsplash wall surface must be clean and in perfect conditions for a great outcome. Apply one coat quality sealer on the mosaic slate tile surface is recommended, the next step is to let it dry. Apply one coat sealer will help to clean the grout leftovers on top of the tile. Divide the wall in 2 parts and apply a very thin coat of thin set back of the slate backsplash, make sure to cover the whole area!! Put the tiles together on the floor to make sure you have a good combination, then prepare to install it. On the center of the wall install the first tile and continue placing them to both left and right till the row is completed. Watch out for the last row, you will probably have to measure and cut to ensure they fit. You can use a wet saw to trim any excess. Grout must be applied in between the tiles after they are completely dry (allow at least 24 hours). Sealer can be applied after a couple of days for better protection. This service can be done as a DIY project (how fun?!) or if this is not really your cup of tea you can call a professional to make sure your tiles will be perfectly installed. Cleaning the slate backsplash is not a difficult task, these tricks to make your gorgeous stone as good as new will help you! Use detergent and warm water, don’t forget to apply it with a cotton sloth. Testing in another area before using on your slate is recommended so you are sure it won’t cause any damages. You can also use a toothbrush or scrub brush to clear the grout. Finish it by drying with a towel. In case you want to remove stains, you should use a mix of water + hydrogen peroxide, put the solution in a spray bottle and apply to the stains. Leave it there for 10 minutes and scrub with a soft material. Amazing results, huh? The slate backsplash will give a unique look to your space and reflect your personal style in all its characteristics. Durability is another great word that comes with slate, the material is resistant to cracks, and traumas. It has incredible waterproof qualities, easy to clean and great material to use in your kitchen. 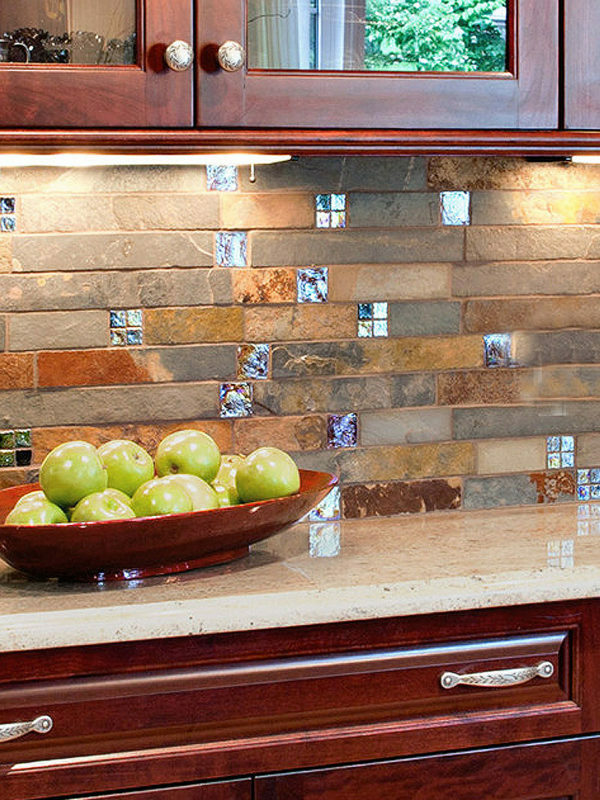 The slate backsplash has a timeless design and the colors are incredible. It is a trend that came to stay! The slate backsplash requires very little care. Of course, is resistant to water, but it needs to be sealed from time to time to prevent damage. By doing this you make sure your product will last longer. All the natural stones tiles have to be sealed and, on the market, you will find types of sealers that can protect your backsplash up to 10 years in a one simple apply! A couple recommended a natural stone sealer. The slate backsplash can be a bit brittle like said before, it requires care in order to have long-lasting durability. But with all its looks and magnificent nature like colors, it is not only worth the money, but also the care: the final look will be impeccable. Some people consider an advantage the fact that the shades can vary, meaning that the slate backsplash that is in your kitchen probably won’t exist in someone else’s kitchen, it is very exclusive material.